As if the home run ball or foul ball you catch at Salt River Fields this spring could be any cooler, well, it’s also historic. The D-backs and Rockies will use special baseball with SRF logos on them throughout Spring Training. Although uniquely logoed baseballs are common in special events like the World Series or All Star Games, it is believed that this is the first time it has been done in Spring Training. The Salt River Fields logo is based on a concept by local Pima artist and calendar stick carver Royce Manuel. Manuel chose to incorporate a rattlesnake to symbolize the D-backs and a mountain to symbolize the Rockies. 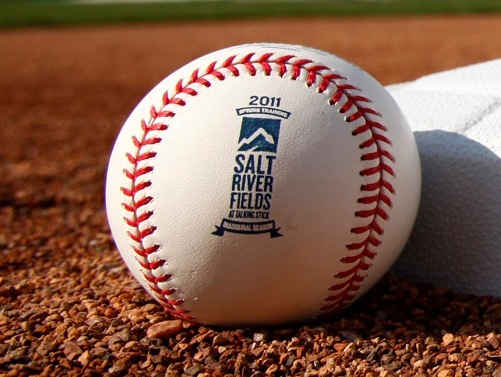 The logo also emphasizes the scenic mountain ranges that surround Salt River Fields at Talking Stick and illustrates the role of the rattlesnake in southwestern Native American legends. Zachary Mazefsky from www.bigleaguebaseballs.com posted a two-part blog on the subject. Mazefsky’s site chronicles the special edition baseballs that are used throughout the game. Indeed, this is an MLB commissioner Allan “Bud” Selig officially stamped ROMLB gamer – not to be confused with any souvenir baseballs. And all fans attending spring training games will have a chance to snag one of these babies throughout the 2011 Cactus League season. So for our ballhawks on the site, if you’re in the area, get down to Salt River Fields at Talking Stick and don’t forget your gloves. I’ll post an update here when Mazefsky posts Part 2 on the subject, which includes an interview with D-backs Director of Special Projects (and friend & supporter of D-blog) Graham Rossini. I’ll be here all day writing about the first game at Salt River Fields, and go ahead and follow me on Twitter (Insider_Writer) for a lot of updates, Twitpics and such.